A mouse stands casually with his legs crossed in a “4”. His reading glasses imply he is perhaps educated, smartly dressed in a single-buttoned jacket and black shoes, he radiates style and class. In a display of extravagance, the four bottles of beer in his hands suggest he has money to spare. Cautiously optimistic, his thirsty friend, the monkey walks up to him, empty hands humbly clasped together in a pleading position with his tail between his legs. A symbol of assumed humility. The t-shirt, torn trousers and gumboots show he is poor, a humble labourer, or squandered all his money and is now down on his luck. Inspired by "traditional cousinship" popularly known as "Chimbuya" or "Mbuyaship" such a narrative is typical of post-independence Zambian tavern art. In a Zambian context, "Mbuyaship" may loosely be described as the friendly jibes that neighbouring tribes take against each other, in this case its the Bemba and the Ngoni. Anyway, according to residents of Mtendere township in Lusaka, the rare specimen detailed here dates back to the 1980s.The somewhat damaged and heavily discoloured painting is in a bar called "Drunkards Pub", a time-honoured opaque beer tavern at the "So Chabe" complex that has obviously changed names over the years. Luckily, unlike many such examples in taverns across the country, the wall in which it was painted had not received a new coat of paint in decades. As a result, the work was quite well preserved, although chipped and bearing a splash of graffiti or two here and there. 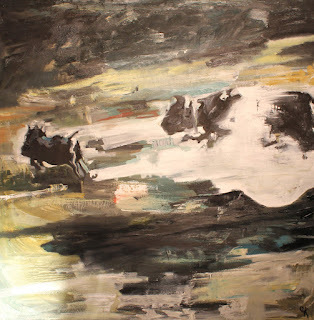 This type of painting was commonplace in the 70s, 80s and perhaps early 90s. Not only did they serve a decorative purpose but would also light heartedly teach patrons of the taverns to share when they have surplus. In the case of this mouse and monkey scenario, the latter had a tendency of switching taverns and disappearing when he has money, only to return to beg when he is broke. But, why the use of a mouse and monkey in this allegory you might ask? Without pretending to be an ethnologist one would say; in the concept of chimbuya or ‘tribal cousinship’ - a playful form of, ‘ethnic sparring’ enjoyed between Zambian tribes that were at war at least a century ago; a mouse represents the Ngoni from the east whereas a monkey represents the Bemba from the north. 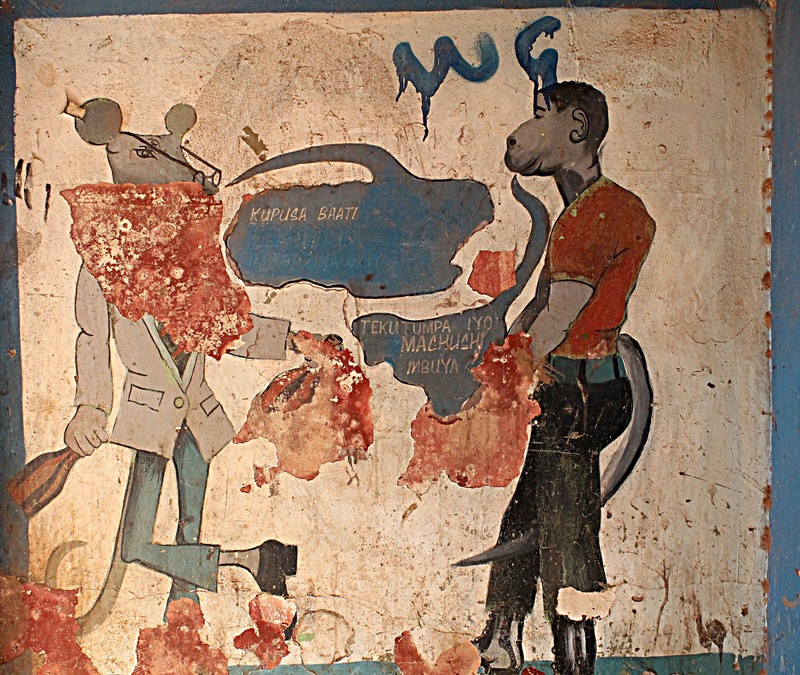 It is not clear why, but the mouse may symbolize the Ngoni because they consider it a culinary delight and the monkey are supposed to be a delicacy to the Bemba. But enough of the symbolism. Although this type of artwork is disappearing in urban Zambia, it used to be commonplace and it harkens back to colonial times. Times when Zambia was still Northern Rhodesia and taverns or beer halls were not only places where hundreds of natives would gather for beer in the evenings but would also engage in social and political debate. Arts expert and Secretary of the Lechwe Art Trust Committee in Lusaka, Roy Kausa grew up on the copperbelt and shares his take on the evolution of Zambian tavern art and how it possibly produced one of Zambia’s greatest artists, a man to whom the design of the country’s most famous monument, the Freedom Statue is attributed, Akwila Simpasa himself. “In the late 50s, when he was still in Chamboli (mine township), in Kitwe, Akwila, used to draw social commentaries on tavern walls in charcoal. The commentaries were based on the moment, hardships that people would undergo,” he says. Being in the colonial era, this of course would have been an outrageous crime attracting severe punishment. “He couldn’t get arrested because the community enjoyed what he was doing and when they hear that the Mine Police are coming they would raise an alarm, quickly help erase the charcoal drawings and hide the artist”. Says Kausa. So in essence, if Kausa’s remarks are anything to go by, tavern art started out as graffiti to the authorities although it was beloved by the township dwellers, who could relate to it because it belonged to them. It was their art, art for the people by the people. In addition, the artist was therefore a folk hero of sorts. Art came to them in the township; they did not have to follow it to a white-walled gallery in the city, for them every day was an exhibition opening. In its own way, this site-specific art challenged the innocence of space much like what conceptual art is doing today; artists such as Akwila are therefore passive or unacknowledged pioneers of contemporary conceptual art without even knowing it. Back to our beloved mouse and monkey. It is sad to see that they have failed to adapt to the present and are no longer there to instil values to tavern patrons because the walls have been painted over with cell phone company advertisements. Sad to see that the two characters have failed to find themselves on the canvas of a gallery artist although this was achieved by Stephen Kappata who died five years ago at 68. 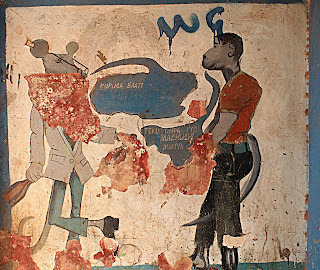 In its golden age, Zambian tavern art did not just depict the monkey and mouse, but also kalulu the hare, ‘Dona Fish’ (mermaids), famous musicians of the time such as Congolese singer Franco and a hairy and clawed biblical King Nebuchadnezzar that taught against pride. One can only hope we are not witnessing the death of a genre, the last kicks of a dying mouse and monkey, something truly Zambian. 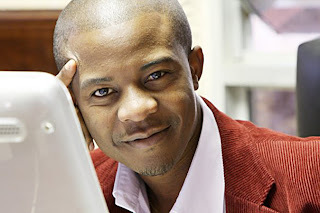 ART columnist Andrew Mulenga is among finalists for the 2012 CNN-MultiChoice African Journalist of the year award. The 'Hole in the Wall' columnist is the only Zambian nominee among 34 finalists from 12 countries across the continent. The finalists were announced last Friday by Ferial Haffajee, chairperson of the independent judging panel. Mulenga, 38, has been writing weekly reviews, critiques and interviews in the column since 2004. 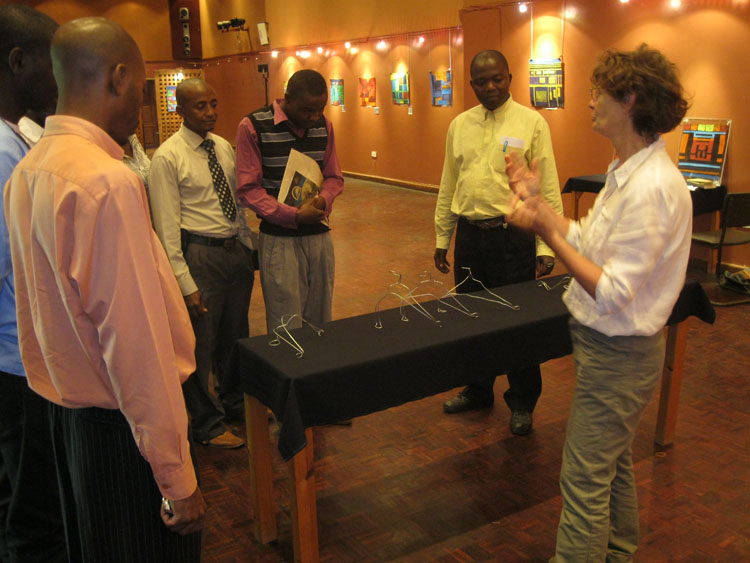 He is also a member of the International Association of Art Critics and interim chairman for the Arterial Network Zambian Chapter, a continental network of creative practitioners. Mulenga described the nomination as encouraging. “When I got a call from the CNN’s London office, at first I thought it was a joke, but apparently the person on the other end of the phone line was dead serious,” he said. 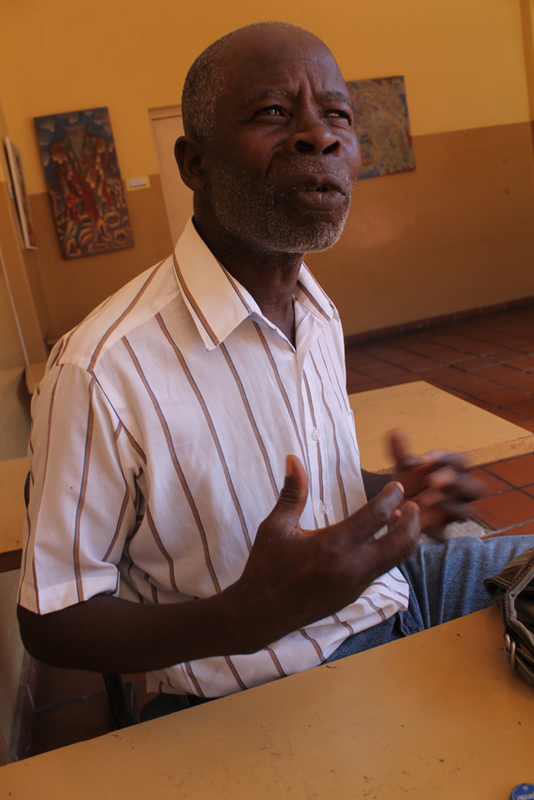 Mulenga said he would like to see more coverage of the arts in the Zambian media, both broadcast and print. “It appears in Zambia news is all about politics; it's almost impossible to get an arts story on a front page or as a lead item unless an artist has died,” he said. Mulenga's articles ‘In Mali, the Kora is no one-night stand, it requires commitment’, and ‘Libanga’ system: DRC’s phenomenon of commercialised praise-singing’ published in the Post Lifestyle last year, are both nominated for the awards. According to a press release, the competition this year received entries from 42 countries from across Africa, the highest number in its 17-year history, and included French and Portuguese speaking Africa. 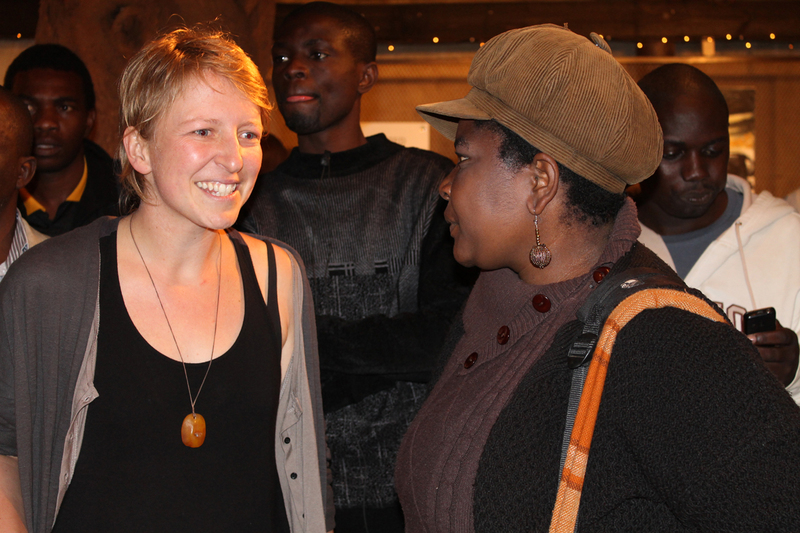 Entries from South Africa, Uganda, Nigeria and Kenya make the bulk of the finalists. The awards ceremony will be held in Lusaka on July 21, and will be presented by CNN International NewsCenter host Isha Sesay and ZNBC's Franklin Tembo Jnr. Finalists will undergo an all-expenses paid five-day programme of workshops, media forums, and networking has been set up for the finalists in the run-up to the award ceremony. Tony Maddox, executive vice-president and managing director of CNN International said 2012 had seen a record number of entries for the CNN MultiChoice African Journalist Awards from a diverse array of countries across the continent. After quite a while, there is finally a show worth noticing on the walls of the shopping area at Intercontinental Hotel, Lusaka. On display are enjoyable images with various narratives in the form of recent works by three of Zambia’s most experienced and prominent artists until the 31st of May. The organisers, Twaya Art Gallery, who used to occupy office space and enjoy ease of access in the shopping area, were sadly relegated to the inconspicuous room 259 on the second floor, much to the detriment of visibility and morale but now seem to have awoken from slumber to host Cynthia Zukas, Poto Kabwe and Style Kunda. But, although the display is of recent works, the storyline of all three artists exudes a somewhat nostalgic, yet enjoyable outlook. However, it is hard to tell whether this is deliberate, or they all share a feeling of longing for a Lusaka or Zambia of periods passed. Most of the works seem to depict an idealized Lusaka uninterrupted by South African-styled shopping malls and espresso bars. 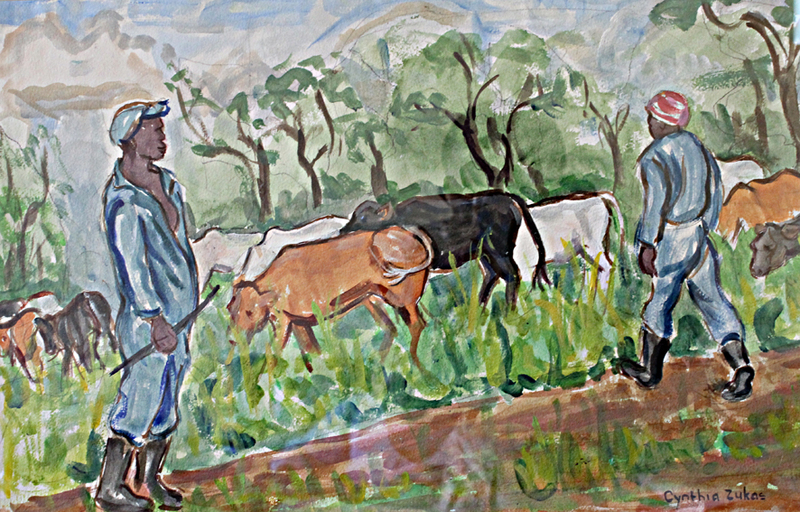 Take a look at Zukas’ ‘Cattle (on the farm)’ a neo-impressionist depiction of cattle herders. If it was not for the farmhands modern overalls and gumboots, the image is timeless. 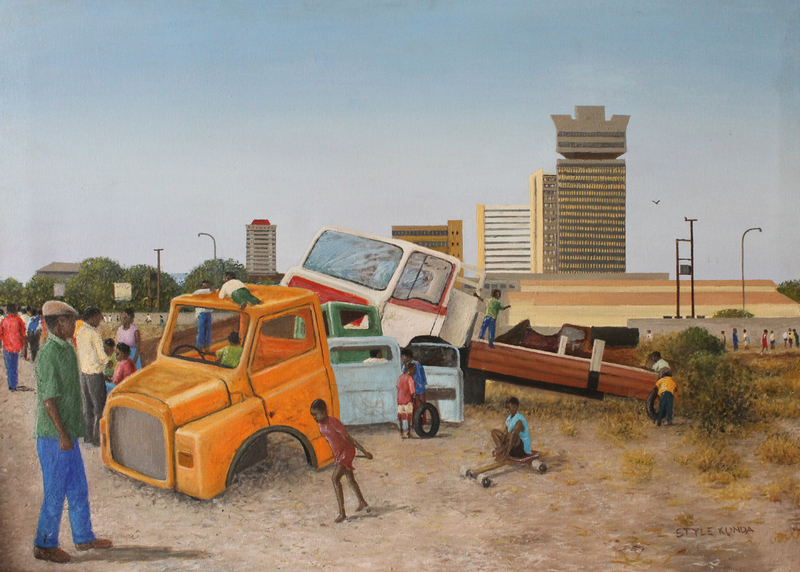 Then there is Kunda’s ‘Play Park’, which shows barefooted children at play on abandoned scrap lorries with a classic Lusaka skyline showing our most prized landmark and utterly outdated tallest building, Findeco House. Kabwe on the other hand offers a timeless shanty township destroyed by heavy rains in a piece entitled Life yamu compound (life in the compound). It shows township dwellers in tattered clothes trying to salvage and rebuild their collapsed houses. Also on display are some purely abstract works by Kunda with a very flat, two-dimensional feel. Not only is the show entertaining to the undemanding art lover, it is a ‘must see’ for anyone seriously intending to collect contemporary Zambian art created out of passion and not necessarily to put food on the table, in the manner of the early post-independent artists. In other words, it is not run of the mill. \In 2011, she was honoured by the Press Freedom Committee of The Post Newspaper (PFC) and granted the Julia Chikamoneka Freedom Award. Nevertheless, Kabwe and Kunda are mostly self-taught, like most local artists obviously due to the arts playing second fiddle and Zambia not having formal national infrastructure to support artistic undertakings. Again, like most of their peers, the obligation to become artists must have been part of the human condition. Kunda was born in Luanshya in 1953. He went to Mpatamatu and Luanshya Correspondence School. Through the late 1960s and early 70s he was a sign painter and only used canvas for the first time in 1977. In 1992, he served as a Gallery attendant for Mpapa Gallery and in the 90s; he was part of the enthusiastic Mbile group along with Godfrey Setti, Patrick Mwemba, Flinto Chandia and Ruth Bush, he lives and works in Lusaka. Perhaps the demands of a lifelong career as a graphic designer in the Zambia Information Services (ZIS) have not permitted Livingstone-based Benjamin Mibenge to become a household name on the gallery scene. However, being a student of Zambian contemporary art legends Akwila Simpasa (who provided Bemba lyrics on Eddy Grant’s song Africa) and Henry Tayali has obviously left an indelible mark on him. This coupled with his own phenomenal talent and experience places him securely among the country’s most important artists of all time. Clearly disappointed by current public and private art patronage, in an interview, the 67-year-old retiree looks back at the Zambian art scene in retrospect and does not like what he sees. “If we try to go back, as far as the 60s things were better than they are today. Artists were respected professionals. This is the time when we had the late Akwila Simpasa and Henry Tayali, we also had Billy Nkunika who is now at the Zambia Open University and Gabriel Ellison who designed the flag and coat of arms”, he says. He adds that not only did government take the arts seriously, but so did indigenous Zambian collectors and patrons, except in recent years both seem to have lost the plot. “We had Tom Mtine, the Zukas’, the Musakanyas and even Simon Mwansa Kapwepwe (first vice-president of Zambia from 1967 to 1970 and later Minister of Culture) himself was a very big supporter and collector of the visual arts. That is why even today you find this young lady, the Kapwepwe who is chairperson for National Arts Council is still involved in the arts she must have taken after her father”. He misses the days when government used to sponsor exhibitions and the state-owned mines would run competitions in schools as he drifts further into the past by talking about his career. “I went to Evelyn Hone College in 1971 and graduated in 1974. I studied art but went into graphic art, and in 1975 I joined ZIS. The same year I was sent to Mozambique and Iran to design Zambian exhibition spaces for trade fairs, I was on a trip abroad at least once a year, merely as a graphic designer”, he remembers. “At ZIS I worked with Aquila Simpasa, my former lecturer as well as Mr Maunga, a brilliant illustrator with work in a lot of Zambian books. I rose from Graphic Designer to Manager Information and retired in 2002”. After retirement, he was approached to redesign the interiors of the Livingstone and Moto Moto Museum in Mbala along with long time friend Pythias Mbewe, formerly curator of the Copperbelt Museum. In fact, Mbewe is another unsung hero whom while just a student at the Evelyn Hone College in the early 70s designed the campus’ Church Road entrance. Here, one can just marvel at the sheer irony in the fact that for decades students have used this entrance without realising it was designed by an alumni. Nevertheless, while he is not impressed with the status quo of the arts in the country, Mibenge still has a lot of confidence and pride in the artists themselves. “I am happy with how hard artists have continued to work even among little or no support. It is not easy. Look at my drawings; I have nowhere to reproduce them in Zambia because no one has the capacity. So I have to send them to South Africa for reproduction”, he explains, “You can imagine how much they will cost after all this? So instead, I have to reproduce them cheaply and at least, sell them. I do have a wife and grand children to support”. 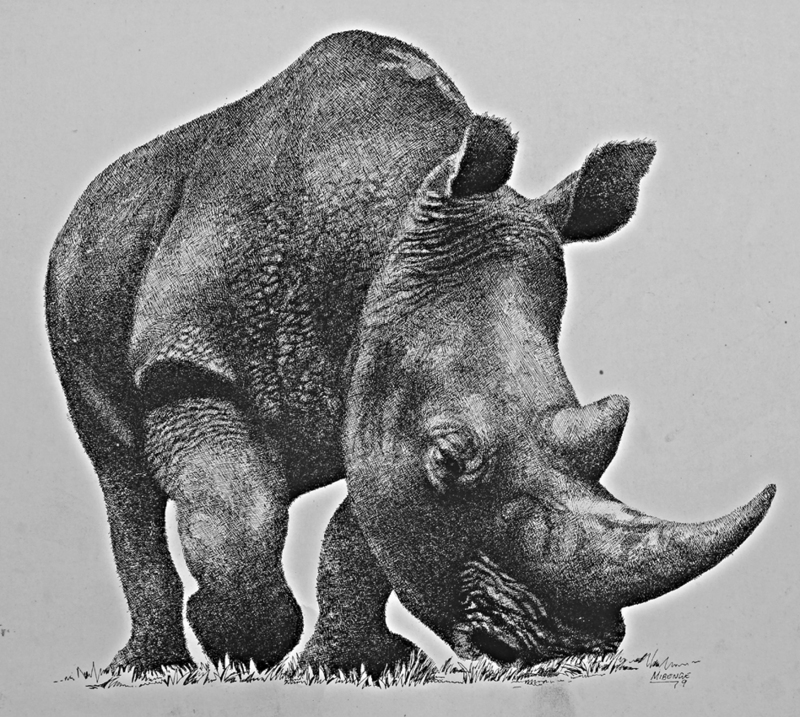 Mibenge’s meticulously executed drawings sell for K300, 000 at the Livingstone museum. It is indeed sad to see such high quality work being sold at Sunday market prices. 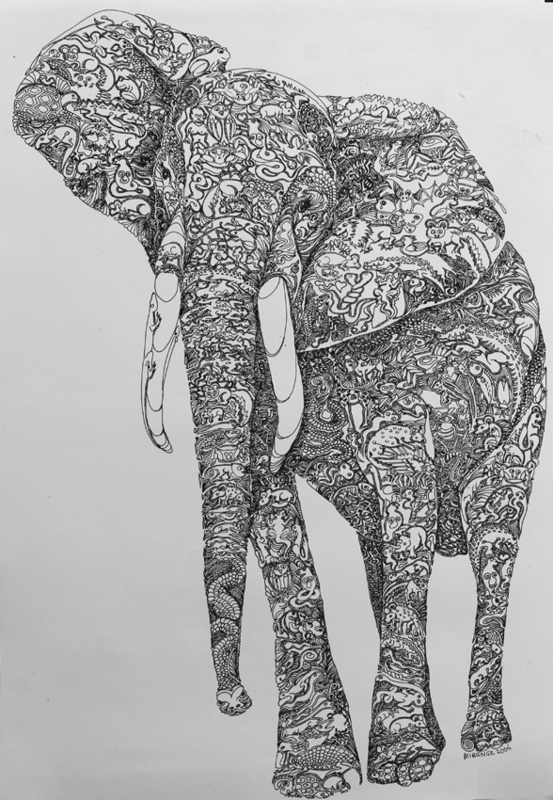 He draws wildlife like nothing you have seen before, where the image of an elephant is made up of a tapestry of intertwined lizards, snakes, lions, monkeys, and mice almost like a decorative tattoo. 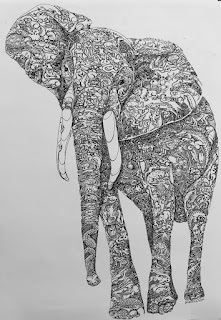 In fact, at a glance his work looks like decorative pen and ink drawings but It is when you draw closer that you can see the complexity of his detail. For the elephant, he explains that according to many African cultures, the animal’s meat is said to contain the combined flavours and meats of every animal in the forest. An elephant’s leg may taste like buffalo, its trunk like warthog, its ears like antelope and so on, which is why his illustration of the animal is a combination of all. An avid environmentalist, Mibenge is Wildlife and Environment Conservation Society of Zambia Livingstone branch chairman. Despite moving to England at a tender age, Emily Kirby’s habitual visits to her Zambian-based parents have clearly had a decisive influence on her work. 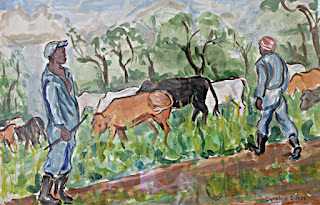 The Londoner is an emerging painter, whose depiction of the Zambian landscape gives it an idealistic aura through her electrifying use of bright colours, evidently defying the fact that she lives and works in a city infamous for its seemingly unfriendly, “mind-your-own-business-type” of citizens and its gloomy weather. Nevertheless, it is particularly in her depiction of wildlife that she reveals her watchful eye and flair for capturing the dramatized if not theatrical portray of animals in motion, rendering them in a few slashes of oil paint with a palette knife and brush stroke. A typical example is “Lion Hunt” that vaguely renders the shadowy image of a lioness in hot pursuit of warthog. “I paint quite quickly. I really enjoy the effect it (speed) has on the work and I think it allows you to be quite intuitive in your sense of creating... because I also work from photos that I take spontaneously. I allow movement to come into the painting,” explains the 31-year-old who is currently affiliated to two trendy London galleries. “I think movement has always been a part of my life from the time I had to leave Zambia. Fleeting moments are important to me, the transient nature of places and capturing people in their environment in a flash". And although she has been painting since as long as she can remember, eventually graduating with a BTEC Art and Design Foundation from Brighton City College in 2004, it is only three years ago that she decided to take up art as a fulltime occupation. This was after she spent some time in the Omo Valley in Ethiopia. 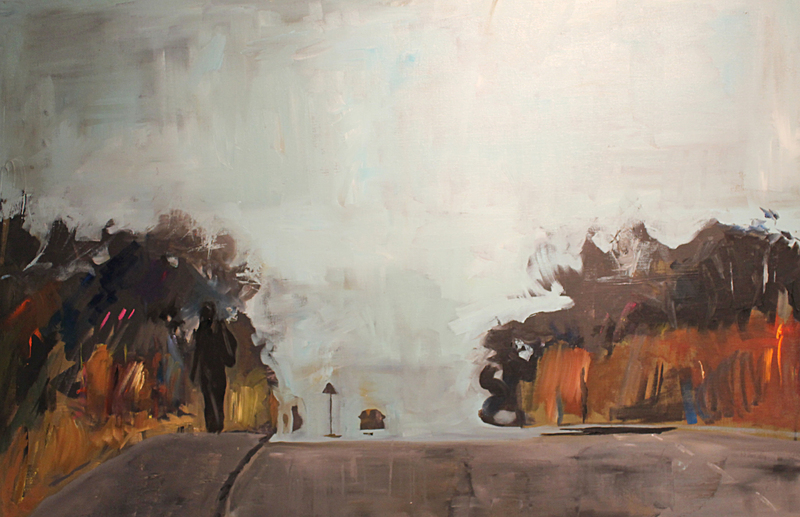 Of late, however, Emily’s work is inspired by a series of road trips she has taken with her father through Zambia and Malawi and she currently finds the human figure as a fascinating object of expression. Her work is on display until the end of May in a small but thoroughly absorbing solo exhibition entitled “Africa Revisited” at the Zebra Crossing Cafe in Lusaka. Here you can see specimens of her road trip series of paintings with titles such as “Road to Kafue” and "Unstopable Force”. What do break dance, wire, Google Earth and paint have in common? De fil en fibre or loosely translated “Wire fibre” an exhibition by French artist Christiane Chaponnière, that is what. Last week, Chaponnière displayed a series of paintings and miniature wire sculptures at the Alliance Francaise in Lusaka. 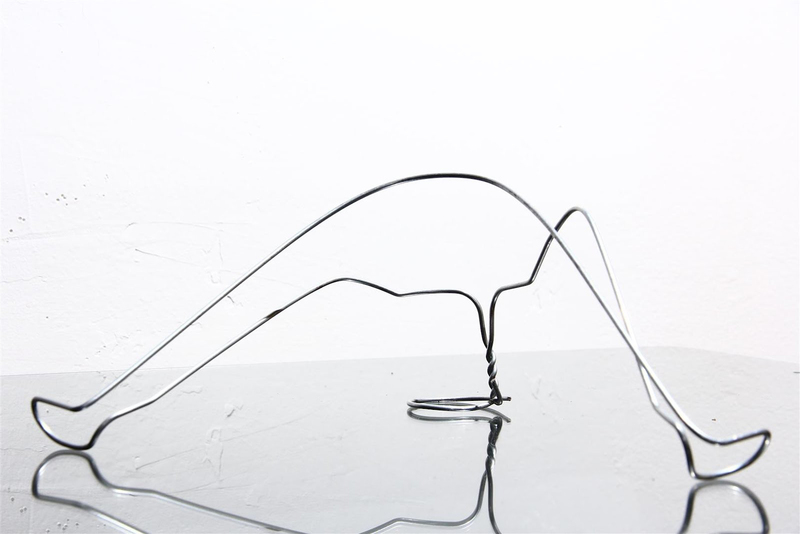 Walking into the exhibition space, particularly if one had not seen some of the publicity material prior to the show, the small sculptures looked like discarded, twisted old hang wires that used to belong in someone’s wardrobe and had now been strewn across some tables. As for the paintings, at a glance they looked like non-objective, geometric abstract art, merely depicting square blobs of paint. However, at closer examination, one discovers that the paintings were inspired by some African city plans including Lusaka. Besides every painting, was a tiny printout of a map from Google Earth, the virtual map and geographical information program originally developed by the Central Intelligence Agency (CIA) that maps the Earth from satellite imagery. As much as Chaponnière, copies the Google maps line for line, she adds her own unique touch of colour. “Sometimes it’s the colours from my dreams, because I dream of places before I visit them. But most of the time I use the colour in relation to the character of the city, if I feel a city is warm and friendly, I use warm colours”, explained the artist last week, before she left for Cape Town to continue her tour of the continent. She started her journey in Alexandria in Egypt, and hopes to end it in the Cape. She entered Zambia by means of the Tazara Railway line because she believes entering a country by road or rail gives one a closer experience to the realities of on ground than flying. 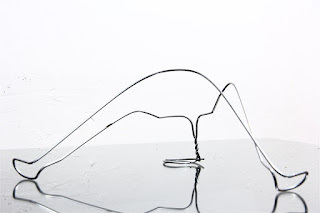 Nevertheless, a closer look at the ‘hang wires’ on the table during the exhibition revealed that the wires suggested the raw movement in hip-hop or break dance. Her work is indeed something out of the ordinary and quite entertaining. Chaponnière graduated from the National School of Fine Arts Paris School and the Louvre in 1968. Professor sculpture in the School of Fine Arts of Algiers in the early 70s and subsequently taught at the French school in Singapore and Bangkok during the 80s. From 2000 to 2005, she carried out arts workshops with street children in Istanbul and Mexico. When she is not globetrotting, she lives and works in Paris.